Start your Lanai Landing Adventure with Kona Coffee, juice and pastries during check-in at Slip #11 in Lahaina Harbor. Souvenir boarding photographs of our passengers are taken by a professional photographer when you board our 49' rigid hull inflatable Explorer Super Raft. Restrooms are conveniently located on board. Before leaving the harbor, guests are supplied with soft-sided lunch cooler bags containing choice of Turkey or Veggie Wrap, buttermilk dressing, Maui chips, cookies and a cold drink. A fresh fruit platter and granola bars are served on board our Explorer “Super” Raft. 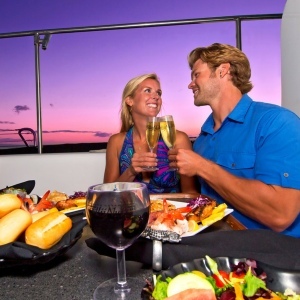 Beverages including bottled water, soda and juices are available from the ice chests on the boat throughout your Lanai Dolphin and Snorkel trip. After leaving Lahaina Harbor, we head across the channel to the island of Lanai. Lanai's resident pod of spinner dolphins are often encountered off the island of Lanai with lots of tropical reef fish, green sea turtles and occasional Manta Rays at the snorkel sites. 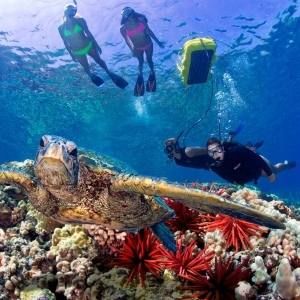 This trip features an off-shore snorkel site either going to or coming from Lanai. A landing is made on Lanai at Manele Harbor and guests then take a short (1/4 mile) walk to Hulopo’e Bay Marine Reserve with its beautiful white sand crescent beach. Shaded picnic tables are available for visiting with new fellow passenger friends while enjoying your picnic lunch. The county park also provides showers and restrooms. Guests can snorkel in the bay, wade or snorkel in the tide pools, hike to Sweetheart Rock or visit the Four Seasons Hotel – all a short distance from the public beach. Guests will enjoy 3+ hours on the island of Lanai, for a total trip of 6.5+ hours on our Lanai Landing Adventure. For a half day tour be sure to check out the Lanai Dolphin Snorkel Adventure. Activities are at your own risk. No pregnant women or those with serious health concerns, recent surgery, or history of neck or back problems. No Smoking permitted on board the boat, or at the dock per State law.